A maquette for what is believed to be the first statue of Jane Austen has been unveiled. The £100,000 life-sized bronze sculpture is to be placed in Basingstoke town centre in July to mark the bicentenary of the author's death. 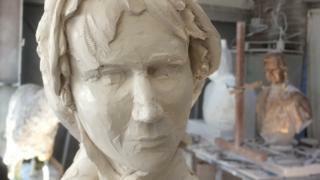 Sculptor Adam Roud said it would represent Austen as a "strong-willed and independent character". Austen spent the first 25 years of her life in Steventon, near Basingstoke, where her father was a vicar. The statue has been commissioned by the Hampshire Cultural Trust and will be placed in Market Place. A crowdfunding campaign has been launched to raise the remaining £10,000 needed for the project. A maquette is a small preliminary sketch, or wax or clay model, from which a work is elaborated. Mr Roud said he wanted the final figure to have "poise and dynamism". "The vision I have is that she is walking in the square and someone has just said 'good morning Jane'. "She was a real person with her own character and hopefully I can get across she was a headstrong woman of her time, but is relevant to us today because of her novels," he added. Jane Austen was born in 1775 in Steventon, where her father was the vicar of St Nicholas Church. The family lived there until they moved to Bath in 1801. Austen knew Basingstoke well and attended social gatherings at the Assembly Rooms in Market Square and regularly visited family friends at The Vyne, Oakley Hall and Ashe House. Her experiences are thought to have provided her with material for her novels. She wrote drafts for Northanger Abbey, Sense and Sensibility and Pride and Prejudice while in Steventon. The maquette was officially unveiled at a launch event in Farleigh House. What Austen actually looked like has been a source of debate among academics. The only confirmed portrait of the author made during her lifetime is by her sister, Cassandra. A waxwork, created using eyewitness accounts, and the help of Emmy award-winning costume designer Andrea Galer and an FBI-trained forensic artist, was unveiled at the Jane Austen Centre in Bath in 2014.